Amongst all the condom joke commercials there have been, this has to be pretty highly ranked: watch this crazy kid smash a supermarket up and lie on his back howling before the killer punchline is delivered. You know from the start there’s gonna be a whole lotta trouble as the sour-faced little brat moodily dumps items into the shopping trolley while Dad (who looks a lot like a young Boris Becker) watches with sheer misery. Then brat features starts demanding sweets at the top of his voice. Dad tells him to be quiet but this is just like a red rag to a bull, the kid losing his mind and firstly pulling and pushing the trolley then doing a demolition job on the various items for sale. As the annoying little brat lies on the floor yowling like a cat with its “*&^ stuck in a mangle, the advice ‘Use condoms’ underlines Dad’s pained expression. According to You Tube, this clip was banned but I find that hard to understand. There are no rude or lewd goings-on just maybe a bit of ironic anti-child sentiment which might have been enough to get it stopped from being broadcast in certain liberal European countries who knows? The extra laughs here are added by the other customers in the supermarket who look on with incredulity at the way this terrible brat is acting up – like some feverish junky in need of a hit. and destructive substance and overdoses of it used to make me hyperactive as a kiddy that’s for sure. 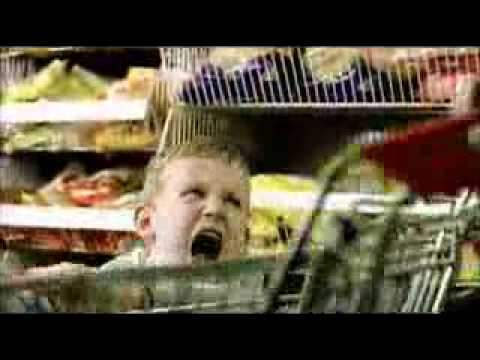 The worst thing that the dad in this commercial could have done is give in to his son’s bullying and got him the sweets. As condom jokes go, this has to be up there with that classic piece of graffiti that was famous in the UK in the 1970s. above a condom machine some wit had written ‘This is the worst chewing gum I have ever tasted’. Heh heh, those contraceptive devices will always have a whole heap of comic mileage from now until the end of time. « Evolution Dance Party, Just Grows and Grows! i LOVE this commercial. i think it should be played everywhere! so funny!